You are required to leave Germany due to completion of assignment or study or whatever reasons, there are few formalities needs to be completed so that it is hassle free and you don't land into any trouble later on. This is almost reverse of processes you did while entering into Germany. Give a notice to your landlord that you plan to leave, the notice period will be as per your contract. Cancel your remaining tickets of local travel in case you have annual ticket or give them to you friends. Inform your gas/electricity agency. Your landlord will help you here to note down the meter readings on the day of leaving apartment. The final settlement will be done after the actual bill is given by agency. There may be additional payment required. Keep following documents safe with you To claim social security refund after 2 years. Get your Lohnsteuerbescheinigung (Annual wage tax statement) from your employer. Keep your bank statements safe for future reference and Income tax return filing purpose. For complete list of documents, click here. Cancel your Health Insurance. This can be done one/two weeks in advance. You can use it for income tax refunds. To get final settlement payment from your employer. 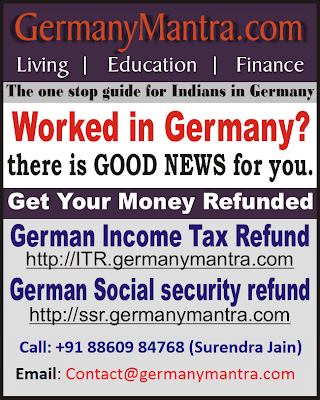 Sometimes, in the absence of German bank account, employer will make payment in India, but deduct 30% tax, which is not refundable. Plan to send your expensive, important, heavy household stuff to India through Cargo or postal service, which can't be accomodated with flight baggage limit. Give notice (Kündigung) to your telephone agency to that you are leaving Germany, so that you can break the contract without paying charges for it. You may need Abmeldung and letter from your company for the same. If you are paying GEZ (for TV and radio usage), make sure to inform them that you are vacating Germany. If possible, fax them a copy of your Abmeldung and revoke the permission you issued for GEZ to debit money from your bank a/c. Please let us know for any addition/deletion. Share your experience with us. Since you leave Germany in middle of the year, you need to file tax return in next calander year after January. You can get some money as refund. The more details are here.